If you want to eat in Paris at a restaurant that offers great atmosphere, old school Paris menus and a real taste of yesteryear you won’t go wrong with a “bouillon”. The bouillon restaurants of Paris were one of the first popular chains of eateries, created at the beginning of the 20th Century. The word bouillon appeared in 1855, invented by a butcher in Paris called Pierre Louis Duval who made a dish of meat and stock for workers at the Les Halles Market. The workers loved the simple, tasty dish. Its fame spread and the rich mixed with the poor in enjoying the unpretentious broth. In 1896 two brothers, Frédéric and Camille Chartier, created a brasserie named ‘Le Bouillon‘ inside a railway station concourse. It started a craze for Bouillon restaurants. There were almost 250 restaurants with the name Bouillon by 1900 and although most are gone, several remain in Paris that are well worth a visit. Built at a time when art deco was all the rage they have kept their glorious interiors and retain the authentic atmosphere of their glory days. 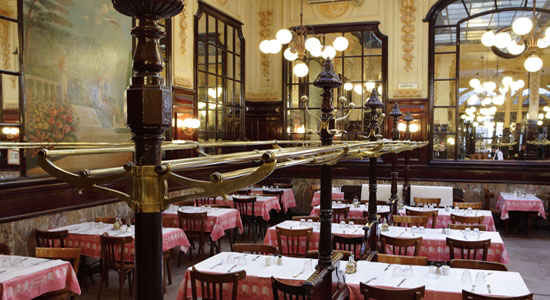 Bouillon Chartier is one of the most perfectly preserved restaurants of old Paris that you’ll find. It is perpetually popular and there is always a long queue. This is a tourist draw but it’s also very popular with Parisians thanks to its inexpensive, traditional dishes and the sheer loveliness of its art deco interior. When you sit in here it is easy to feel transported back over a century ago to when the restaurant first opened. Today the restaurant is a living legend that serves a traditional menu at great prices (main courses around €10) and it is a an authentic hark back to the past. Don’t be put off by the queues, the waiters have had a lot of experience, you’ll find the queue moves quickly, order taking is swift, food delivery is very un-French, it arrives speedily. The ethos of the restaurant was always “hearty food at a modest price” – that has not changed and neither has the stunning interior. From the wonderful revolving doors, the magnificent glass roof, wooden sideboards, old fashioned bistro style chairs and tables, certainly visitors who were here a hundred years ago would recognise it today. You’ll notice the little wooden numbered drawers – they were where in the old days, regulars would store their own personal napkins! 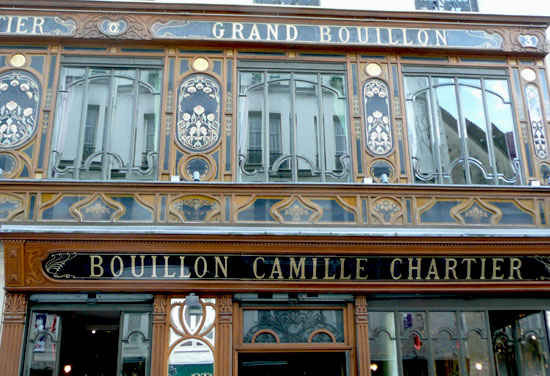 Originally called the Grand Bouillon Camille Chartier after the owner (see above) and retaining the signage, this restaurant was opened in 1906. After renovation in 1996 the Bouillon Racine became a listed building with its carved woodwork, beautiful bevelled mirrors, mosaics and Parisian style gold leaf lettering. The menu is traditional and very reasonably priced, it has a great ambience but the jewel in the crown is the gorgeous interior. 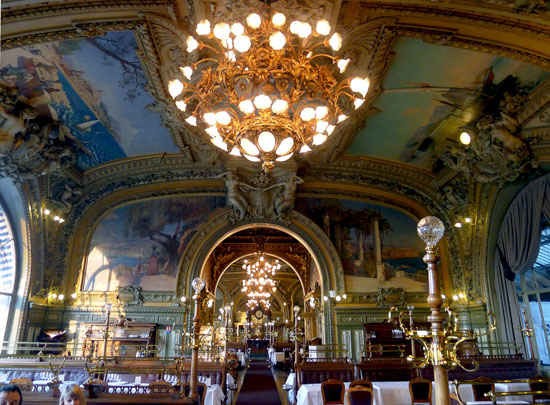 Paul Gaugin was a customer and would have enjoyed the fanciful and elegant design of this Belle Epoque restaurant which looks much today as it did when he visited. It’s a little pricier than Bouillon Chartier but not expensive. 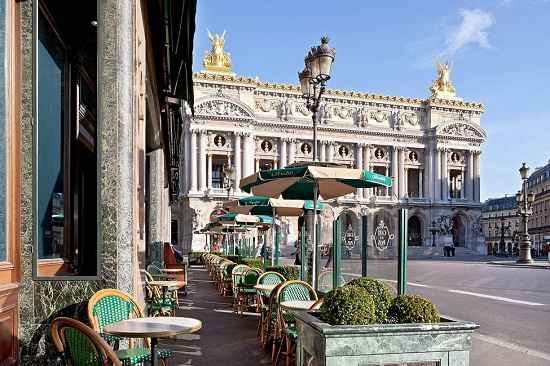 Close to the flamboyant Paris opera house and built by the same architect, Charles Garnier, Café de la Paix is a Paris institution. Inaugurated in 1862 by Empress Eugenie of France, the Hotel de La Paix and Café de la Paix are famous worldwide and exude elegance. Listed frescoes, sumptuous gilding, extravagantly decorated, an award winning oyster bar, with a pricey menu to match, though more reasonable at lunchtimes on the terrace which faces the Opera Garnier. A restaurant in a train station doesn’t sound like much to get excited about. However this station buffet is not like the others. Opened in 1901 and called the Buffet de la Gare de Lyon it overlooked the platforms, from the outside giving no hint of the delights within. Grand arched windows, glittering gold cherubs and cornices, dazzling chandeliers and wall to wall paintings and ceilings with scenes of Paris, the south of France and the French Alps. Past regulars include Coco Chanel, Brigitte Bardot, Jean Cocteau and Salvador Dali amongst many others and many will recognise it as the Paris restaurant featured in Mr Bean’s Holiday (2007). You will be drawn to its extravagant and opulent interior and lured back for the fabulous food or a drink in the luxurious Big Ben Bar. 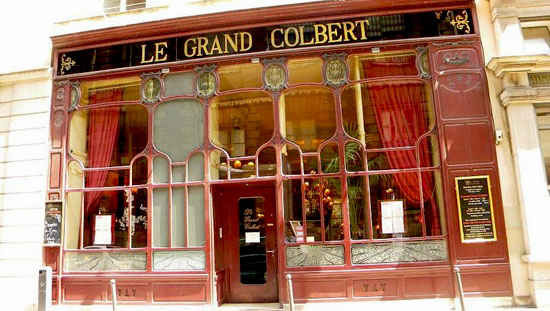 Le Grand Colbert is one of the grand brasseries of Paris in the heart of the city’s theatreland. The original building was erected in 1637 by Guillaume de Serrant based on plans by Le Vau and started life as a private town house. It was sold to Jean-Baptiste Colbert, minister of Louis XIV, in 1665, then to Philippe of Orleans in 1719. After a period of neglect it was torn down, rebuilt and opened as Galerie Colbert in 1828. Au Grand Colbert was a shop that became a restaurant in 1900. It is now a listed building and the restaurant is very popular with Parisian media types, actors, supermodels, designers as well as business people and tourists. With its 6m high walls, mosaic floor, sculptures and paintings, padded banquettes and art deco globe lights, this is elegant Paris at its best. The keen-eyed amonst you may recognise this as the Paris restaurant where Jack Nicholson, Keanu Reeves and Diane Keeton dined in “Something’s Gotta Give” (2003). The menu is varied, traditional food, original recipes in the medium to high range in price, and known for its excellent hot chocolate served in the afternoon tea room. 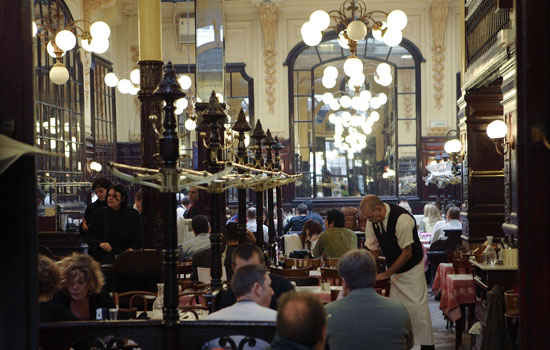 Established in 1921, Le Café du Commerce is one of the great Bouillons (see above) of Paris. Popular with locals as well as tourists, this restaurant offers a traditional menu as well as a unique selling point. You can choose your oysters at the entrance and they will be prepared in front of you to take away or enjoy inside. The beautiful glass roof of the building makes for a light and airy interior, the plants give a comfy feel, the mosaic floor is perfect and the service is friendly and informal. 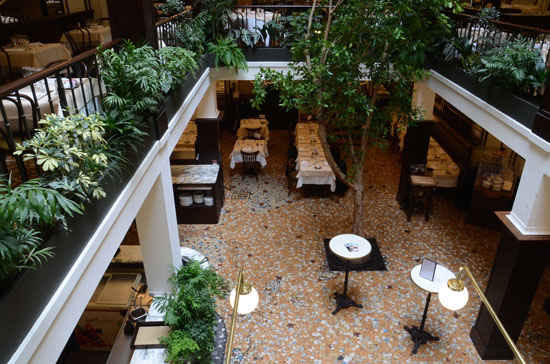 Set on three floors around a central courtyard, this is an unusual taste of the past with a good price menu. Paris on a budget – lots of ideas of things to do that cost you nothing!